Keep your nail essentials organized. Manicure organizers are absolutely essential for the woman who takes religious care of her nails. Even if you don't tend to spend too much time on your nails, investing in one of these may be a wise choice - it will make it easy to find your tools when the time comes to freshen up your manicure! Simply put, a manicure organizer is designed to keep your nail polishes and implements in one place. This may come in especially handy for the avid nail polish collector - just ask the millions of women who have spent years shelling out big bucks for new bottles every week! Since nail polish does not necessarily go bad over time and can be "revived" with a touch of polish thinner, it's easy to hang onto those bottles for a lifetime. Unfortunately, finding a place for many bottles can prove quite challenging, and eventually those coveted nail polishes may be relegated to whatever spare drawer space is available at any given time. If that is not the fate you imagined for your pretty polishes (and we doubt it is! ), you will find the solution in a manicure organizer. Similarly, an abundance of manicure tools can be easily misplaced over time. For the simple fact that they are relatively slim, small implements, they should ideally be kept in a special organizer. 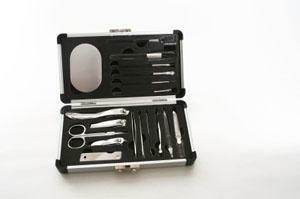 Even more important, however, is the need for manicure tools to remain sanitary. Though they should be cleaned prior to each usage, it's always better to keep them in an area free of dust and debris. Simply tossing them loosely into a drawer isn't a great idea. Your tools stand a better chance of longevity if they are properly stored, too. You won't necessarily find a whole section at the drugstore or beauty supply store devoted to manicure organizers. You will certainly find manicure kits - that is, small collections of tools packaged in a plastic box or, more conveniently, in a roll-up bag. Those types of packages can easily serve as organizers, particularly if the box or bag has individual compartments to keep each piece separate. For your existing tools, though, and for your myriad nail polishes, you may require something spacious enough to hold those essentials safely. Avid nail polish collectors often skip the traditional storage boxes and opt for the "big guns" instead - in this case, giant media racks with enough storage space for hundreds upon hundreds of bottles. The Catty Bag is ideal for nail technicians or anyone who takes her nail goodies on the go (heavy travelers, for example, or those who do their friends' nails for weddings or parties). Consider it a portable storage station, with enough room to hold all the implements necessary for a fantastic manicure, a wide selection of nail polishes, top coats and base coats and pampering hand and massage lotions, too. Tweezerman is renowned for its world-class tweezers, but the company also offers a not-too-shabby collection of nail beauty kits, too. The Manicure Solution Kit contains a nail clipper, nail cleaner, cuticle and hangnail clipper, ceramic nail file, manicure sticks, shaping tool and a nail brush, all packaged in a convenient (and chic!) ivory roll-up cosmetics case. Everything stays put in this snug little bag, so it's ideal for toting along to the nail salon when you want to use your own tools for safety purposes. The Dr. Carolyn Collection Cheetah Print Deluxe Nail Kit is packed in an adorable bag just made for the fashionable female. It includes all of the essentials required for a flawless manicure, and it even has a small extra pocket to store your favorite nail polishes. This is a great gift idea, and it's also perfect to tote to the salon. Everything has its place!